Subject: Proposal of the Staff Side to record disagreement of the unsettled 6th CPC anomalies and to refer the same to Arbitrator. I am directed to refer to your letter no. NC-JCM-2008/6th CPC dated 14.08.2017 on the subject cited above and to say that the comments received from Department of Pension & PW vide OM No. 42/21/2009-P&PW(G)33199 dated 09/04/2018 regarding “Parity/Modified Parity in pension/revised pension/family pension of all pre-1996 retirees with those who retired on or after 01.01.2006 is enclosed. 2. It is requested that comments on the aforesaid item if any, may please be forwarded to this Department. The undersigned is directed to refer to DoPT’s DO No. 11/1/2015-JCA dated 26.03.2018 on the subject cited above and to say that the comments of this Department in respect of Item No 15,16,17 & 21 are enclosed (Annex-A). Item no. 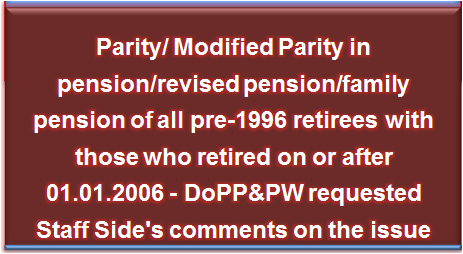 15,16,17&21:- Parity/ Modified Parity in pension/revised pension/family pension of all pre-1996 retirees with those who retired on or after 01.01.2006 . Scale from which the pensioner had retired and in the case of HAG+ and above scales, this will be fifty per cent of the minimum of the revised Pay Scale. “The pension calculated at 50% of the minimum of pay in the pay band plus grade pay would be calculated at the minimum of the pay in the pay band (irrespective of the pre-revised scale of pay) plus the grade pay corresponding to the pre-revised pay scale. For example, if a pensioner had retired in the pro-revised scale of pay of Rs.18400-22400, the corresponding pay band being Rs. 37400-67000 and the corresponding grade pay being Rs. 10,000/- p.m., his minimum guaranteed pension would be 50% ofRs. 37,4001 Rs. 10,000 (i.e. Rs. 23,700). The pension will be reduced pro-rata, where the pensioner had less than the required service for full pension as per rule 49 of the CCS(Pension) Rules, 1972 as applicable on 01.01.2006 and in no case it will be less than Rs. 3500/- p.m.
3. In the Agenda item, the JCM (Staff side) claimed that the revised pension/family pension of all pic-2006 pensioners/family pensioners would not be less than 50% of the minimum of the pay band l grade pay, corresponding to the pre-revised pay scale from which pensioner had retired, as arrived at with reference to the fitment tables annexed to Ministry of Finance, Department of Expenditure’s O.M. No. l/l/2008-IC dated 30.8.2008. 4. In the last meeting of the Anomaly Committee the staff side argued that a reading of the recommendation of the Sixth Pay Commission on the matter indicated that the intent of the Pay Commission was to grant modified parity to pro-01.01.2006 pensioners by allowing the same fitment benefit as is being recommended to the existing Government employees subject to the provision that revised pension shall not be lower than 50% of the minimum of the pay in the pay band prescribed for the grade pay and the sum of the grade pay with reference to the minimum of the pay band plus the grade pay which is not consistent with the recommendation of the Sixth CPC. Officer of Department of Expenditure stated that this was not the intent of me recommendation of the Pay Commission. After some discussion, the Staff Side request the Official Side to examine the matter once again. (i) Orders were issued vide this Department’s OM of even number dated 28.1.2013 for stepping up of pension of pre-2006 pensioners w.e.f. 24.9.2012 to 50% of the minimum of pay in the pay band and grade pay corresponding to pre-revised pay scale from which the pensioner retired. Para 5 of this OM provides that in case the consolidated pension/family pension calculated as per para 4.1 of OM. No.38/37/08-P&PW (A) dated 192008 is higher than the pension/family pension calculated in the manner indicated in the OM. dated 28.1.2013, the same (higher consolidated pension/family pension) will continue to be treated as basic pension/family pension. (ii) Subsequently, in compliance of an order dated 1.11.2oll of the Hon’ble CAT, Principal Bench in OA No. 655/2010, order dated 29.4.2013 of Hon’ble, High Court of Delhi in WP (C) No. 1535/2012 and order dated 17.3.2015 of Hon’ble Supreme Court in SLP (C) No. 36148/2013, order were issued vide this Department’s 4 O.M. No.38/37/O8-P&PW(A) dated 30.7.2015 that the pension/family pension of all pre ~ 2006 pensioners/family pensioners may be revised in accordance with this Department’s O.M. No.38/3 7/08-P&PW(A) dated 28.1.2013 with effect from 1.1.2006 instead of24.9.2012. (iii) Vide OM. No.38/37/08-P&PW(A) dated 6.4.2016, it was decided that the revised consolidated pension of pre-2006 pensioners shall not be lower than 50% of the minimum of the pay in the Pay Band and the grade pay (wherever applicable) corresponding to the pre-revised pay scale as per fitment table without pro-rata reduction of pension even if they had qualifying service of less than 33 years at the time of retirement. 6. With the issue of the aforesaid orders, the demand of the staff side in regard to modified parity to pre-2006 pensioners has been accepted and implemented. Proposal of the Staff Side to record disagreement of the unsettled 6th CPC anomalies and to refer the same to Arbitrator, pensioner had retired in the pro-revised scale of pay of Rs.18400-22400, the corresponding pay band being Rs. 37400-67000 and the corresponding grade pay being Rs. 10,000/- p.m., his minimum guaranteed pension would be 50% ofRs. 37,4001 Rs. 10,000 (i.e. Rs. 23,700).